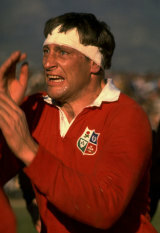 Although he played 63 times for Ireland in a 13-year international career, 11 times as captain, Willie John McBride will forever be associated with the British and Irish Lions, with whom he toured five times and won 17 caps. Although he had to play nine Tests before tasting success, he was a key member of two of the most successful tours in the history of the Lions - New Zealand in 1971 and South Africa in 1974. Against the All Blacks he was pack leader. In South Africa three years later he was captain of the team and led his squad to an unprecedented unbeaten tour and a series win. Yet McBride did not pick up a rugby ball until his late teens. But by the time he was 21 he was already a full international and had played his first two tests for the Lions against the Springboks in 1962. Originally from Ulster, he was a genial man off the field, regularly disarming hotel managers who were irate at the behaviour of some of the players. But on the paddock it was a different matter, especially on that 1974 tour and the infamous '99 call', a signal for the Lions to get their retaliation in first. He also tasted success in the emerald green of Ireland, notably in their first win against the Springboks in 1965 and when Ireland beat Australia in Sydney - the first time a Home Nation had defeated a southern hemisphere team in their own country. McBride retired from international rugby in 1975. Fittingly he scored his only try for Ireland in his last international at Lansdowne Road against France although his final game would be against Wales in Cardiff. Inevitably for such a legendary player McBride went into coaching and guided the Ireland team for a period. He also managed the 1983 Lions tour to New Zealand which, it is fair to say, was not as successful as his playing experiences there in 1971.